MEA member Kevin Bell and three seniors from his Negaunee High School Computer-Aided Design (CAD) class will compete next month for the Upper Peninsula school’s ninth straight national title in a model bridge building contest that tests students’ design, engineering, and construction skills. Next month, two senior teams in Kevin Bell’s CAD class will compete in a state-level model bridge building contest, and one—above, right—will try for a ninth-straight national title for Negaunee High School. The highly competitive TRAC Bridge Challenge now accepts six entries from more than 250 junior and senior teams vying to compete from across the country, so even being accepted into the competition is tough. In previous years, only three teams were selected to compete. In 2011, Bell’s three teams represented the entire national competition. Students apply for entry by writing a proposal and submitting drawings and photos of their design process and bridge. Those who are accepted to compete must deliver a PowerPoint presentation and watch their model go through strength testing. 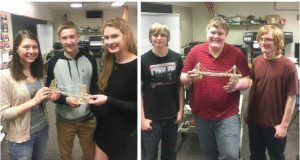 Students spend months researching, designing, constructing and testing model bridges made of balsa wood, glue, and string that can bear weight. Bell’s winning team last year built a bridge that weighed 26 grams and held 254 pounds. The key is scoring a high strength-to-weight ratio. Bell’s students have competed for years in competitions at both the state and national level. This year both of his three-person teams qualified for the state competition, administered by the Michigan Department of Transportation and judged by working engineers from MDOT. And Bell recently learned one of his teams will be headed to Tennessee for this year’s national challenge run by the American Association of State Highway and Transportation Officials. The challenge in both competitions this year was to construct a self-anchored suspension bridge. The teams have spent a lot of time doing compression and torsion testing of their materials and different kinds of joints. There is trial-and-error, redesigning, and revising to be done. The end product combines students’ knowledge and research with their unique style, Bell said. “It’s cool to see I have two teams working in the same classroom and how different their designs are to achieve the same function,” Bell said. A former student at Negaunee High School, Bell was recruited to start a CAD program when he was hired as a teacher in 1992—after graduating from a program at Northern Michigan University where he had only done design work on a board with pencil and paper. He has since built a unique four-year CAD program that attracts both college-bound students interested in mechanical, architectural, and civil engineering and those interested in a skilled trades career after high school. Bell also teaches welding and wood-working at the school. A feeder program at the middle school—taught by Bell’s brother—introduces students to design concepts using pencil and paper on drafting boards. When they move through Bell’s program throughout their high school careers, students use the same software as professionals in the field. The reasons for the program’s huge success are many, Bell said. Not many school districts are committed to fund a CAD program that students can follow from middle school through all four years of high school. The program starts with the basics on pencil and paper to build students’ foundational understanding, before transitioning in second semester of freshman year to using the technical equipment that Bell has acquired: computers, software, 3-D printers. Nearly all of his students go on to some kind of career in engineering or a skilled trade in industry, he said. Both of Bell’s teams will attend the MDOT 2018 Michigan Design and Build Bridge Challenge on May 1. In addition, the team known as Bridge Builders of Negaunee—Dan Nash, Isaac Varty, and Marc Herring—will go to the AASHTO TRAC Bridge Challenge in Tennessee on May 21-23.